Account administrators can deactivate team members who are not able to access projects temporary. This feature is useful for organizations working with freelancers, or vendors. Login to ScrumDesk as a user who is an account administrator. Typically it is the first who registered for ScrumDesk account. 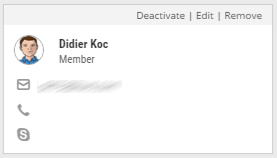 Click avatar in the left menu and then Account Settings. Click MEMBERS page to access users management. 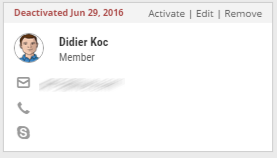 To add new user account to your company account, click + button displayed on the top row. Then fill out an email to your colleague and click Invite. In case you reach the limit of free user licenses, you will be informed by the message displayed with the yellow background (see the picture below). Admin – company account administrator, the person will be able to allow an access to ScrumDesk, manage billing details, plus to track project assets as typical users. Manager – user able to manage accounts, but not other company details. Plus able to track project assets as typical users. Member – typical user able to track project assets as typical users. Guest – free account for your stakeholders, clients or managers who want to be informed about the progress, however, should not change anything. Sometimes team member should not temporarily access project data. In such case, their account can be de/activated. Point a mouse over user’s card and then you will find links to manage activation. It is not possible to assign deactivated users to tasks, but all their work will not be lost. 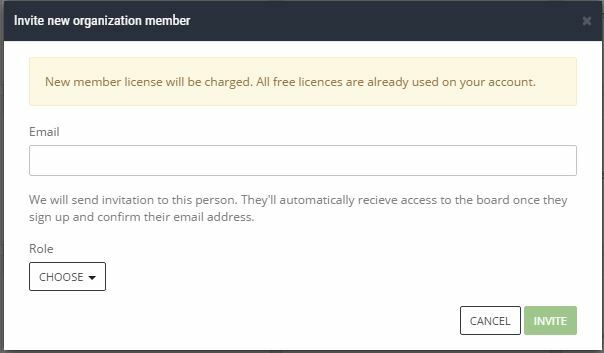 Later, when they will start to work with your team again, the administrator will just activate theirs user license and they are in.